I talk a lot about the nerves that ruin so many magic tricks. These same nerves are the reason some magic tricks never make it past the practice stage. These nerves are usually born from a lack of confidence and this can only be overcome by getting out there and performing in front of people… but how can you do that when you are too scared because your nerves have overcome you. It can be a vicious cycle. My philosophy has always been one of entertaining tricks over difficult magic tricks. I was toying with a magic trick that eventually became the Frog Prince trick for over a year. The trick was great and largely successful but it was hard to do. I thought to myself ‘what about I bring it back to basics with the classic Frog Prince Fairytale?’ This fairytale premise revolves around a prince that has been turned into a frog by an evil witch and only a kiss from a princess will restore him to his natural state as a human prince. There was one move that was causing me a bit of trouble. You essentially have to be able to pull off a smooth double lift or a flawless top change. These two techniques can be achieved with repetitive practice but it brings us back to the vicious cycle I mentioned earlier. Hmmm? 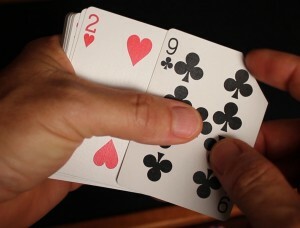 I need a way to force a card that is simple to do, a natural position that remains throughout the magic trick as to not rouse suspicion among the audience, all under the proviso that minimum card handling skills are required. That feels like a big ask. These quandaries lead me to revisiting old notes from some of my older magic books. These books were full of amazing ideas and they were available for free online at “The Learned Pig”, which has since been shutdown and re opened by Chris Wasshuber from lybrary.com. It is free to sign up for an account and you will get access to an excellent source for ebooks and some free magic books other than the ones at The Leaned Pig The notes that I took from version one of The Learned Pig made me realize that a lot of what appears on the market today is essentially just different versions of the original magic tricks. I was looking for a way to change one card into another without too much fuss. I came across a note and pen drawing that wasn’t accompanied by a reference to which book it came from. I don’t know which long dead magician to thank but thank you anyway. I have since searched all over and still haven’t seen any reference too it so I have called it the “Sneaky Card Sleight”. 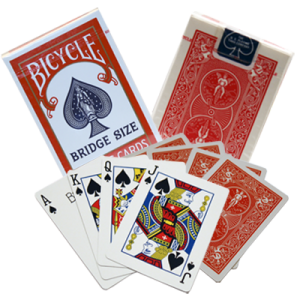 trick.If you already have an old pack of playing cards, be sure to use them, or why not treat yourself to a brand new deck and use your current deck for the sneaky card sleight? It is worth every cent you spend. Did you enjoy this Sneaky Card Sleight Trick? To learn more simple magic tricks Click here!